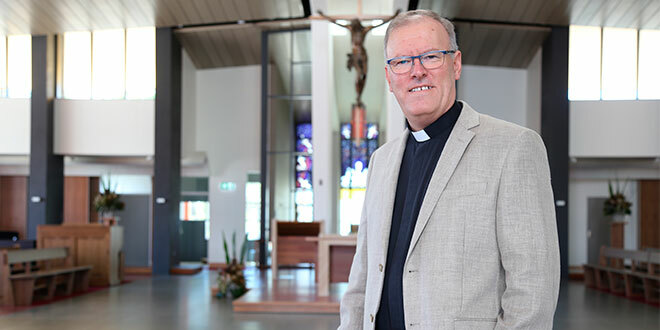 BISHOP-elect Ken Howell is asking for prayers in preparation for his episcopal ordination as the next auxiliary bishop of Brisbane on June 14. “Certainly it is a privilege and I am asking people to pray for me because I’m sure it is only through prayer that I will come to a deeper appreciation of the ministry that will be my life now,” Bishop-elect Howell said. Arrangements are being finalised for the ordination ceremony, to be held in St Stephen’s Cathedral, just 10 days before his 34th anniversary in the priesthood. Even after all those years, developing many pastoral and administrative skills and facing many challenges, Bishop-elect Howell, 59, admits his episcopal appointment will launch him into uncharted territory. “… To be appointed a bishop there may be skills that I have that are an advantage here, but first and foremost it is a gift of faith you take with you and leads you forward into this,” he said. Ken Howell entered the seminary while still a teenager, and was ordained in 1983. As a priest, he served in three parishes, was secretary to Archbishop John Bathersby for 13 years, served as dean of St Stephen’s Cathedral and was vice-rector of Holy Spirit Seminary Queensland. One of Bishop-elect Howell’s most challenging appointments was taking charge of the “rebirth” at St Mary’s, South Brisbane. “For me it has been ever unfolding, meeting many challenges, reflecting on that and faith seeing me through,” he said. Many will recognise Bishop-elect Howell as parish priest at Burleigh Heads, wearing a hardhat and high-visibility vest, overseeing the construction and completion of the Mother of Mercy Church at Marymount. The new church was dedicated on March 10, and just 10 days later, he received a phone call from apostolic nuncio Archbishop Adolfo Tito Yllana to say he had been called to serve as an auxiliary bishop. Since then, and as part of his own preparation, Bishop-elect Howell has spent time on retreat with Lismore Bishop Greg Homeming. “I guess it was a blessing at my retreat that I was able to grow in appreciation more of myself, of Christ and how Christ will use me in this particular way as a bishop,” he said. While Bishop-elect Howell is asking for prayers, he said the reaction to his episcopal appointment had been “most humbling”. “The importance of people’s encouragement is critical and it has been delightful,” he said. The ordination will begin at 11am on June 14 at St Stephen’s Cathedral, Brisbane and will be live-streamed via archbne.org/bzw.